The University of Bristol and the Green Capital Partnership have convened a series of conversations between Bristol academics and city ‘thinkers’ to discuss Bristol’s capacities as a future city. The second of our conversations discussed ‘austerity and service delivery’, building on the ideas emerging from the first workshop which was on governance. 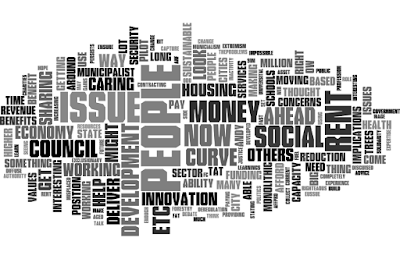 ‘Austerity’ impacts on the public sector and the city in many ways and it impacts unevenly on different places, sectors and social groups. It can also be used as a (short term) excuse for sidelining environmental obligations - resulting in even greater problems further into the future. It was interesting to see, in the Netherlands recently, civil society taking their government to court to demand stronger carbon cutting targets despite tight finances. The court ordered the government to cut emissions by 25% within five years rather than the planned 14-17% in order to protect citizens from climate change. What could a city like Bristol do to lead the way in challenging government? In the public sector, many would argue that much of the scope for efficiency gains has already been used up. The further cuts that seem likely will impact not only on the ways in which the public sector provides public services but also on whether it provides some services at all. It is under enormous pressure to maintain services despite increasingly constrained resources and staff are feeling the strain. What is the opportunity to do things differently? In some places, the ideas of ‘entrepreneurial municipalism’ and ‘municipal entrepreneurialism’ are gaining traction. 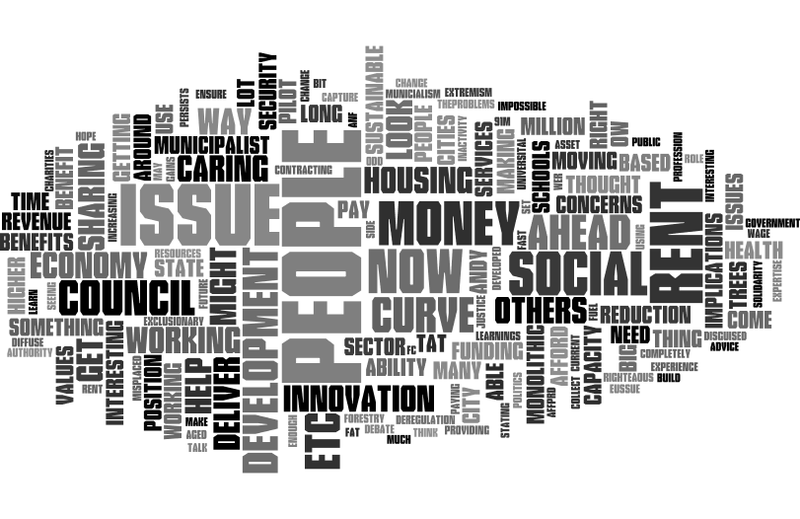 How can the council be more entrepreneurial, and how can the entrepreneurs in the city be enabled to provide municipal wellbeing (services to support the wellbeing of citizens in the city) in different forms? Or how do these come together - the public sector being more entrepreneurial, the private and civic sectors being more municipal? This agenda could be an opportunity to rethink ‘prosperity’ and to challenge the GDP growth paradigm to bring long term planetary and social justice benefits. We can see in so many ways that the current economic system isn't working, so what are the opportunities for change? In the past, ambitions to get people to consume less have failed where people have resisted any infringing on their personal freedoms but, in the interests of their own communities and if, as one participant contributed, it is framed as a way of avoiding ‘stuffocation’ to lead more fulfilled lives, could it be better received? There could also be a role for the major institutions in the city too - for example the NHS through the Bristol Royal Infirmary and Southmead complexes account for about 10% of all travel in the city through staff, patients and visitors. It also has a civic function in addressing the ‘wellness’ of its patients and citizens more widely – developing links with communities to address chronic health problems – but can we / should we seek to change the rules on health spending to address causes before they become illnesses and if so, how do we account for the lag that will result whilst historical ill health works its way through the system? What is within local powers and what should be if we want to take a longer term view? Blog 1: Delivering the ‘Future City’: does Bristol have the governance capacities it needs?